By moving from Phases A (Architectural Vision) to H (Architecture Change Management), TOGAF ensures that your grand architectural vision will be built securely. And by rolling through TOGAF’s ADM Phases with LeanIX, this architectural vision can downright come alive. When laying the first bricks of the ADM, one must: (1) define an architectural vision; (2) examine the scope of the entire project; and then (3) plan which stakeholders are to be involved. LeanIX provides a ready data model for any TOGAF project that is configurable and able to be adapted to your needs. 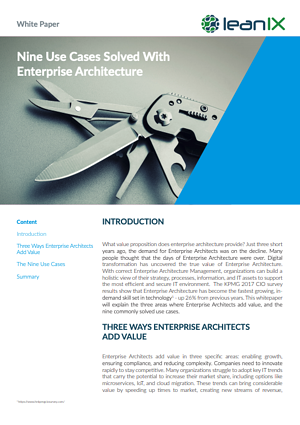 Your company’s strategy and business model will determine your architectural vision so consider attaching your TOGAF "Request for Architecture Work" and "Architecture Definition Document" right inside a LeanIX Fact Sheet—the single-page repositories for all information on architectural objects—to supplement Phase A. Establishing a Fact Sheet for a Project can also help you store central information for your new ADM. Customize this page to display estimated set-up and implementation timelines, budget costs, providers involved, and all related applications plus affected business capabilities. List the names and roles associated to all the properties of your operation by assigning individual(s) to a Fact Sheet—whether as “Responsible” or “Observer” or “Accountable”. This is a simple way to see who is involved in your architecture’s development and for what reason. 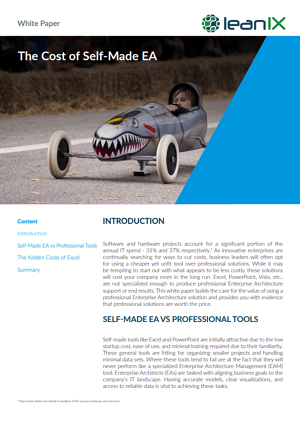 As well, Fact Sheets can be configured to not only show high-level strategic drivers but also the individuals responsible for the applications under review. Example: For the Fact Sheet "AC Management V1" below, three individuals, each with different job functions and responsibilities have been attached to the application. It is obvious who is in charge of maintaining the data. Image 1: View of associated project and application stakeholders in the Fact Sheet application "AC Management V1" in the EA management tool LeanIX. After setting your architectural sights in Phase A, it's time to determine what gaps exist between your baseline and target architecture (i.e., what you have and what you want). From your Business to Information Systems to Technology Architectures, Phases B, C, and D is when you reveal what's actually sitting inside your operation. This is when LeanIX's most-prized functionalities work best. Once all Applications have been mapped to business capabilities and contextualized with information relating to their use cases, a strategic overview of your Application Landscape can be conducted to determine their benefit in your future architecture. Conclude whether applications should be left untouched based on usage-levels and purpose, modernized through investments due to ongoing business value, merged or substituted because of redundancy, or eliminated altogether. Image 2: An Application Landscape report presenting the Technical Fit of an operation's applications through five status levels: "Inappropriate"; "Unreasonable"; "Adequate"; "Fully appropriate"; and "n/a". A Data Flow shows applications as they appear in their respective context by visually presenting how Data Objects are processed and exchanged. Deeper levels of technical attributes are available within the visualizer to help Enterprise Architects gain in-depth knowledge of an application’s full integration. Look at the ways below in which "AC Management V1" is tied to other services in an operation. It directly feeds into "HR Admin", which in turn communicates to "Payroll Europe" in order to provide data for "Salary Compact". Image 3: A Data Flow report charting an application's ("AC Management V1") integration and process. Use detailed tables to probe IT components from across all operational hierarchies by exploring key technical attributes. LeanIX utilizes Technology Stacks to categorize IT Components (e.g., Database, Operating System, Web Server) and form complete overviews of your technology landscape. In the picture below, what are the lifecycles of the services being contributed by a Provider (orange)? Is change needed? Image 4: An IT Component Matrix report on an operation's varying technical components (arranged by Provider and Technical Stack). With your architecture effectively described and targeted (and your sanity now restored…), it’s time to actually plan what you want to transform. Phase E and F is when to rest the surveying tools and concretely act on your vision: What's going to change with this architectural re-design? And are you giving your builders the best master blueprint? Does your project, as-is, present value to your overall operation? 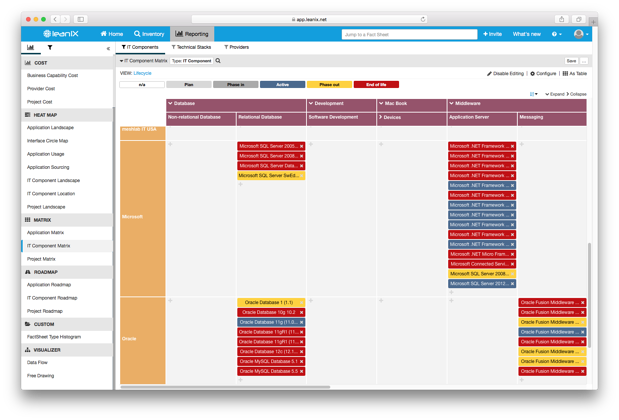 Use the Project Portfolio, a matrix report that groups all systems according to Business Value and Project Risk, to identify what needs cancelling or just more review. When your IT Manager wants to know which applications to keep aboard or jettison, consult the report (like in the example below), to make your appraisal. Based on the image below, it appears that there is a clustering of architectural data posing "Significant benefit" to the value of the business—but also a worrisome blotch representing only "Marginal benefit". Image 5: A Project Portfolio report showing Business Value versus Project Risk. See when your Enterprise’s indispensable applications are set to be phased-out of service—or if they have been already—with the Lifecycles view of the Application Matrix report. As you can see in the example below of applications listed by department and country/region, Brazil's "AC Management V1" service will end in 2019 but "AC Management V2" is queued up to replace it already. There are many other views available in addition to Lifecycles, too. Sort by Functional Fit to see high-level details on the quality of an application to determine whether it is "Unreasonable", "Insufficient", "Appropriate", or "Perfect". Image 6: The lifecycles of an operation's applications, arranged by year and by working status, as seen in the Application Matrix report. 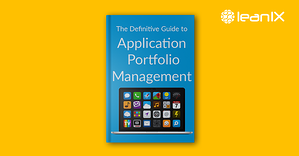 Want to know if successors are in place for when your applications reach their end-of-life? The Application Roadmap report allows users to see, in clear terms, what is active and for how much longer—and what is standing by to replace it. Additionally, LeanIX’s Application Roadmap shows users the lifecycles of an application’s directly corresponding components. In the Roadmap example below, we can see the Lifecycle timeline of "AC Management V1" plus its related Successors. Though it seems to be on a collision course into Phase out (yellow) territory, the application's replacement, "AC Management V2", is appearing to come online a tad before 2019 to ensure a clean transition. Image 7: An Application Roadmap report displaying, by year (“Any (effective between 2017-03-01 and 2028-07-25)), the service lifecycles and successors of applications. Everything is decided. Your vision has been drawn up, your needs have been made plain, and your builders have received their marching orders. 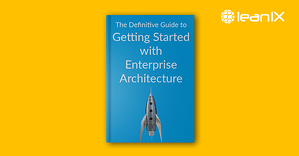 It's finally time to implement your new architecture. Closely follow this construction using LeanIX’s collaborative features for swift change management. Inside configurable drag-and-drop dashboards tied to your LeanIX Home Page, both new and pending actions related to your project can be observed. 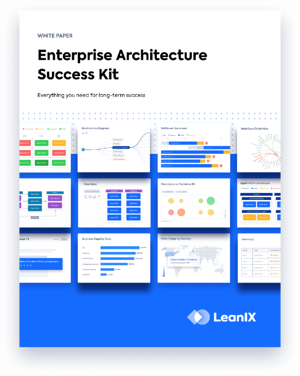 The most important statistics you need to govern your architecture, all in one place, to direct workflows and enable responsive EA behaviour. Image 8: Dashboard boxes on a LeanIX Home Page showing "Application per Business Criticality" and "Data Sensitivity" statistics. Information needed to update your projects can be collected from all responsible parties without sending individual mailings. Using a LeanIX Survey, EAs can request current data on pressing topics like GDPR, save the information in templates for re-use, and have the results returned in clear terms—even while the survey is still running. Perhaps you want to know just how well your stakeholders are adhering to IT security standards? In the example below for a "2018 IT Security Survey", there are many available options to narrow down the parameters of questions to get the right overview you need. Image 9: A look at a survey template ("2018 IT Security Survey") in LeanIX. 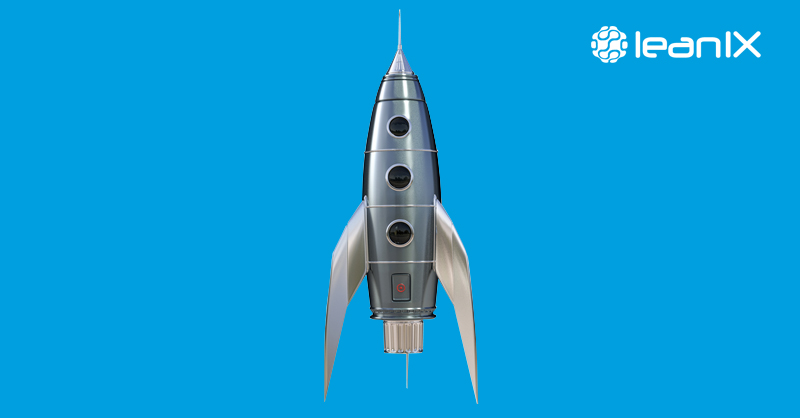 Inspect the lifecycles of past, current, or planned company-wide applications. View this data in LeanIX’s own interface or have it downloaded directly to a .pdf sheet. Below you can see that many applications current for 2018 assigned to the Customer Relationship Management category are in the Phase out or End of life stages. Image 10: The lifecycles of applications, filtered by “Application > Any (effective in 2018)", in the Application Landscape report. The five lifecycle stages of an application appear in colour. 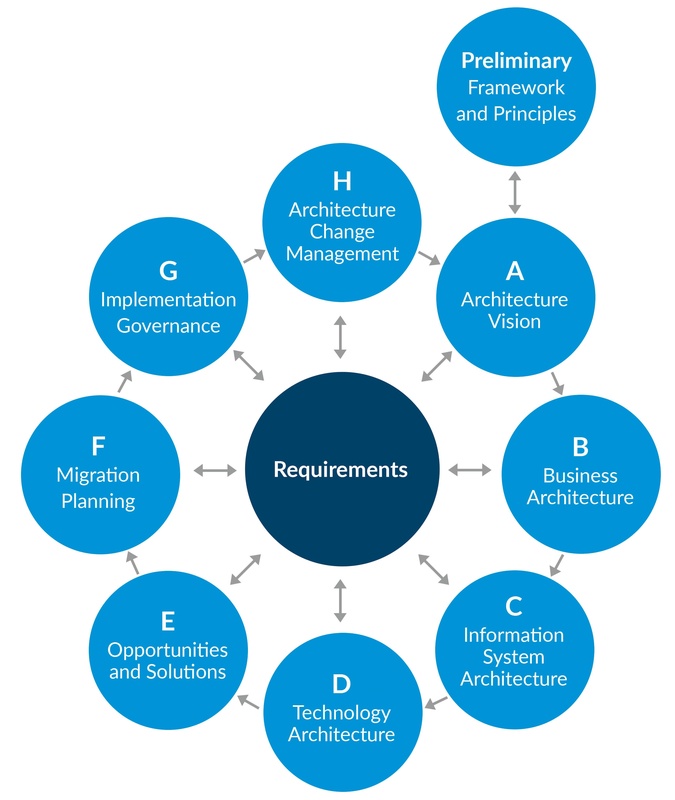 Today's agile approaches to IT management owe much of their success to the architectural standards set first by TOGAF. 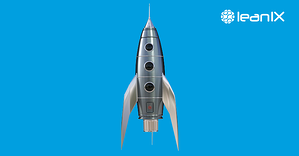 However, the rush to digitalization in thriving modern businesses require EAs—both new and old-school—to recognize all best practices in order to truly integrate networks of Information, Business, and Technology. Using LeanIX reports and data collection to progress through the Phases of the TOGAF Architectural Development Method is a way to capitalize on decades' worth of EA ideology all at once. Whether building the (1) foundations of your architectural vision using comprehensive Fact Sheets, (2) assessing current-to-future business infrastructures with Application Landscape views, (3) making investment decisions on applications using detailed metrics and matrices, and (4) overseeing implementation with configurable dashboards and surveys, LeanIX is designed to satisfy every breed of EA.